BUILDING A WORLD WHERE EVERYONE BELONGS, EVERYONE THRIVES, AND HAS AGENCY OVER THEIR LIVES. PICO California supports grassroots organizing which enables people of faith to build power to reshape their lives and their communities. Our network of organizations trains leaders and equips them with tools to fight racism and build a more equitable and just society. Established in 1994, PICO California organizes in 73 cities, 35 school districts, and in more than seventy-five percent of the state's Senate and Assembly districts. We are deeply connected with communities through congregations and religions institutions and we work in coalition across racial, economic, ethnic, and religious lines. We are comprised of 19 non-profit organizations made up of 480 interfaith congregations, schools, and neighborhood institutions representing 450,000 families. We bring our local federations together throughout California to affect meaningful budget and policy change at the state level. We believe that we are radically interconnected despite our differences, and that together, we can build Beloved Community-just society where everyone belongs! Our society proposes a false choice that we are safer when we are segregated from one another, but we know better! We build beloved community because we know that human beings don’t belong in cages, community members should not be criminalized because of their skin color or where they come from, and that there are enough resources to care for everyone. Because of our sincere commitment to become One People with One Fight, we organize to make sure that everyone has access to, among other things, affordable and safe housing, quality healthcare, equitable education opportunities, a living wage, and security within their own bodies. Theresa Smith’s heartache began long before the five Anaheim Police officers shot 15 bullets into her son, Caesar Cruz’s back, while he sat unarmed, still buckled into his seatbelt. It began long before the Orange County District Attorney’s office found that the shooting was “justified.” Her heartache began when Caesar — a Latino male, a son, husband, and father of five—like so many people of color in California, and across the country, began being consistently targeted and racially profiled by law enforcement. Ms. Smith says, “He would call me all the time and say that they stopped and would search him for no reason. They profiled him as a gang member because of his race, his baldhead, and his tattoos. They would make excuses to stop him in his car, or while he was walking to his children’s school and often they would not even give him a ticket. This would happen at least once-a-month.” So much was lost on that fateful day in 2009; not only for Caesar’s family, but also for his entire community who was robbed of a kind soul, a gentle storyteller, an engaged father, and a community volunteer. Theresa Smith is heartbroken, but she is also determined and powerful. On September 2, 2015, Theresa Smith went to Sacramento, along with over 1,000 concerned residents from across the state, to advocate for AB 953. While in front of the large crowd, she spread Caesar’s ashes on the steps of the Capitol building. She said, “I wanted to bring Caesar with me to Sacramento and I want to leave a part of him here.” She closed by saying, “for us, as mothers who have lost our children so suddenly and so violently, there is no justice. So what we are asking for instead is accountability.” With the passage of AB 953, California is on its way to ensuring police accountability for all of the Theresa Smith’s in California—of whom there are far too many. Caesar and Theresa are why we resist. PICO California’s path to building a more just world involves teaching people of faith how to build and exercise their own power to address the root causes of the problems they face, resist racially, socially, and economically unjust policies and laws, and in turn, revitalize and strengthen the life of congregations and communities. PICO California supports the development and training of clergy to build their capacity, social analysis, and political acumen so they can engage their congregations and peers in promoting racial and social justice. Our engagement with clergy focuses on gun violence, economic disparities, the effects of poor education and lack of effective resourcing, over-criminalization of people of color, affordable housing/displacement, and racism, implicit bias, and other areas of imminent need that they highlight. PICO California and our partners have played a strategic role that has helped bring forth many victories that have been life changing for those most impacted by the pain of racist and economic oppression in California. Occasionally, our work has included lobbying around particular legislative or policy vehicles. In these instances, PICO California and local federations use unrestricted funding to support costs associated with these direct lobbying efforts. PICO California and our partners celebrated the historic signing of AB 953 into law—one of the strongest bills to address racial and identity profiling in the country. AB 953 (The Racial & Identity Profiling Act of 2015—by Assemblymember Dr. Shirley Weber) helps to eliminate the repressive and ineffective practice of racial and identity profiling, and improves law enforcement transparency and accountability. PICO California organizations (a founding member of the Communities United Coalition) worked tirelessly to educate policymakers about the need to end racial and identity profiling, and to expose the abuses of law enforcement authority, holding dozens of meetings and trainings across the state and leading a powerful action at the Capitol. 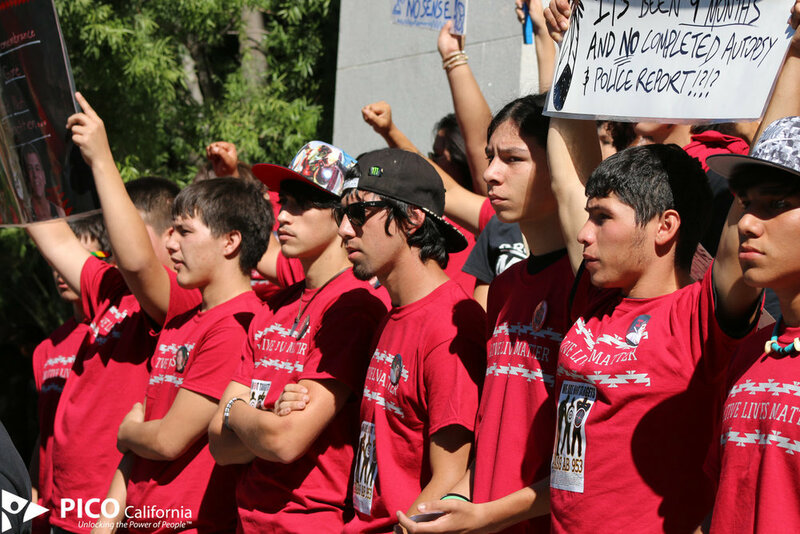 Governor Brown signed AB 953 on Saturday, October 3, 2015 just two days before an impending hunger strike led by members of the Communities United Coalition was set to begin. Download our full report to learn more about PICO California’s extensive organizing efforts to end racial and identity profiling. Key partners include: Communities United for Fair Policing Coalition founding members ACLU of California, Asian Americans Advancing Justice, Dignity & Power Now, PICO California, Reform California, and Youth Justice Coalition. Other grassroots groups and advocacy organizations such as the Courage Campaign, Incite Insight, and Amplify supported the effort. California made history on November 4, 2014, when 59.6 percent of the electorate voted Yes on Proposition 47. The initiative, the first of its kind in the nation, reclassifies six nonviolent felonies as misdemeanors and represents an important step forward in our work to dismantle and reverse the damage caused by mass incarceration in our state and country. Proposition 47 is a groundbreaking initiative that goes further than any ballot initiative in history to undo some of the worst excesses of the war on drugs (and its severely disproportionate impact on communities of color). Thousands of people now behind bars will be eligible for release and thousands fewer will be incarcerated annually. Through the PICO Action Fund, PICO California’s 19 local community-organizing groups played a pivotal role in the passage of Proposition 47. Working in partnership with Californians for Safe Neighborhoods and Schools and the California Calls Action Fund, we built a powerful grassroots civic engagement program focused on new and infrequent voters, primarily of color, who exercised their voting power to pass this historic measure. PICO California developed and executed our voter engagement program for the 2014 mid-term election, which leveraged 22,000 hours of volunteer time, resulting in 250,000 conversations with new and infrequent voters, particularly voters of color and young people, and the identification of 105,163 “yes” voters to pass Proposition 47. PICO California and our immigration partners have played significant roles in the strategic efforts to increase understanding of the need for new state policies that expand the rights and protection of undocumented immigrants. Our volunteer leaders have provided countless testimonies about the impact that policies like Secure Communities have had on families, and have worked closely with our allies to lift up the need for policy that protects undocumented residents from detention and deportation. With our coalition partners, wecapitalized on the momentum to shape the public debate around federal immigration reform, helping to create a political opportunity for California to lead on immigrant rights. The state of California took a bold step when Governor Brown signed AB 4, the Trust Act, which limits local law enforcement cooperation with the Secure Communities program and protects undocumented residents from detention and deportation. PICO California volunteer leaders have a long history of work to advance immigrant rights, including driver’s licenses for undocumented residents. In the past, we worked with Senator Gil Cedillo (the originalchampion of driver’s licenses for undocumented residents), including holding town halls around the state in 2004 to build public awareness.. After more than a decade,, PICO California and immigration rights advocates celebrated the signing of AB60, which allows any eligible California resident to receive a driver’s license, regardless of immigration status. In 2013, Estefania Hermosillo, a PICO California leader from the Central Valley, was among a group of clergy and lay leaders who met with Governor Brown about our budget and policy priorities. In that meeting, she shared her story and that of her family’s need to drive — with or without a license. While she expressed her appreciation for his signing of the driver’s license for DACA youth, shealso lifted up the need to extend the privilege to all immigrants in the state, regardless of their documentation status. Estefania Hermosillo was later invited to introduce Governor Brown at the signing ceremony in Fresno. PICO California federations are currently working on implementation by hosting forums to raise awareness and supporting efforts to prepare immigrants for the application process. Partners include: The Center for Immigrant Policy (CIPC), Mexican American Legal Defense and Education Fund (MALDEF), and Coalition for Human Rights of Los Angeles (CHIRLA). Through our long-term commitment to increase opportunity for formerly incarcerated community members, PICO California has advanced various campaigns to ensure economic dignity. In 2013, PICO California co-sponsored with partners AB 218, which requires state and local government agencies to remove questions about prior convictions from their job applications. As part of our work to advance efforts to “Ban the Box,” we supported the firstresearch day led by formerly incarcerated individuals, testified at hearings, and hosted forums and trainings in local communities. With the passage of this state legislation, which built on our local work and victories in cities like Richmond, AB 218 opened up the opportunity for government jobs to nearly seven million formerly incarcerated individuals. Bill sponsors include: All of Us or None, National Employment Law Project (NELP), and Legal Services for Prisoners with Children. In June 2013, Governor Jerry Brown signed Local Control Funding Formula (LCFF), marking a radical shift in K-12 education funding to drive billions of dollars to schools and districts serving California’s most at-risk students: English language learners, low-income students, and foster youth. Our work on equitable funding spans more than a decade, including releasing a report with partners in 2008, called “Now That We Have the Facts,” detailing the results of a statewide survey of parents and students calling for an equitable funding system to support all students graduating college and career ready. We were part of the coalition that worked over many years to raise awareness among policy makers of the need fora more equitable funding system. Our work with partners on Prop 30 raised the revenue necessary to fund it. Since the passage of LCFF, PICO California leaders have been working locally and at the state level to make sure this historic civil rights win is implemented with fidelity and truly begins to address historic inequities in educational opportunities and academic outcomes. Our work has included co-authoring a best practices guide for engaging parents in LCFF, organizing in 10 districts around the state, and PICO California leaders and clergy testifying at State Board of Education hearings about LCAP regulations and LCFF implementation. Key partners include: Children Now, ACLU, Ed Trust West, Public Advocates, Campaign for Quality Education, and Californians for Justice.